You’ve read from us, the fate of Transformers: Robots In Disguise animated series. On the article, we’ve mentioned a Keynote speech by Stephen Davis; Hasbro’s executive vice president and chief content officer at the MIP Junior Conference 2015. The Keynote address is now online revealing some jaw-dropping details. Mr. Davis revealed that the Writers’ Room went on for 3 successful months. The end result was Transformers Live Action Movies for the next 10 Years. He mentioned that Transformers 5 is on it’s way… AND also Transformers 6, 7 and 8. In fact, the whole idea of having a Writers’ » Continue Reading. The post Hasbro Confirms Transformers 5, 6, 7 And 8 Live Action Movies appeared first on Transformer World 2005 - TFW2005.COM. The first figure reveal for BotCon 2016 is upon us. 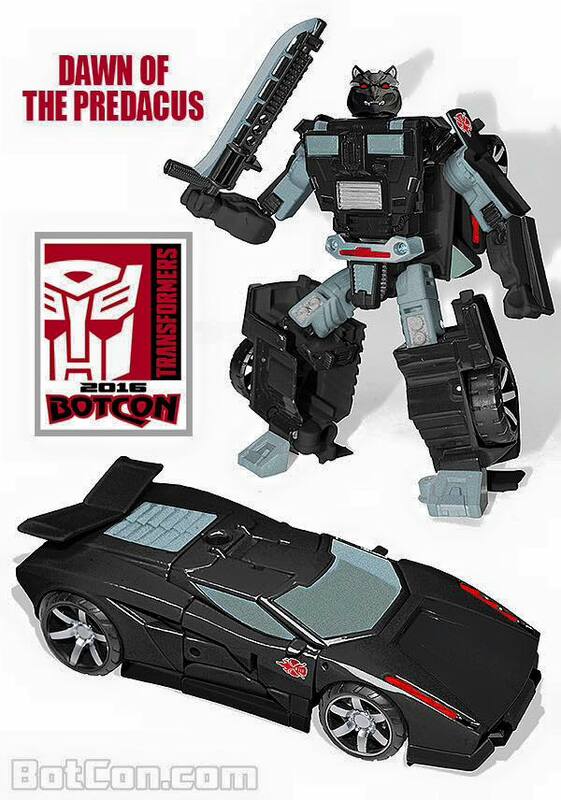 Revealed through the BotCon’s Facebook page, BotCon has shown off their version of Tripredacus Agent Ravage. This figure will be part of another Combiner Wars team, uses the Breakdown mold, with a newly sculpted head. More information from BotCon: The BotCon 2016 Convention box set will celebrate the 20th anniversary of the ground breaking cartoon and toy line BEAST WARS. Prepare for the “DAWN OF THE PREDACUS”. Our first reveal from the 2016 Exclusive Convention box set is the former DECEPTICON who was reprogrammed and rebuilt… as a PREDACON! » Continue Reading. The post First BotCon 2016 Figure Revealed appeared first on Transformer World 2005 - TFW2005.COM. MIP Junior Conference 2015 (an Expo dedicated to all-things children’s media in Europe) is happening right now in Cannes, France. One of the highlights of the show is Hasbro executive vice president and chief content officer Stephen Davis delivering a Keynote speech on the company’s transformation into a 360-degree entertainment provider. Of course Hasbro was at the show floor advertising their upcoming shows. A friend of TFW2005 picked up a brochure highlighting the number of episodes planned for various animated shows and among them was Transformers Robots In Disguise. He also brought us some info to be shared with the » Continue Reading. The post Transformers: Robots In Disguise Season 2 Episode Count Revealed appeared first on Transformer World 2005 - TFW2005.COM. 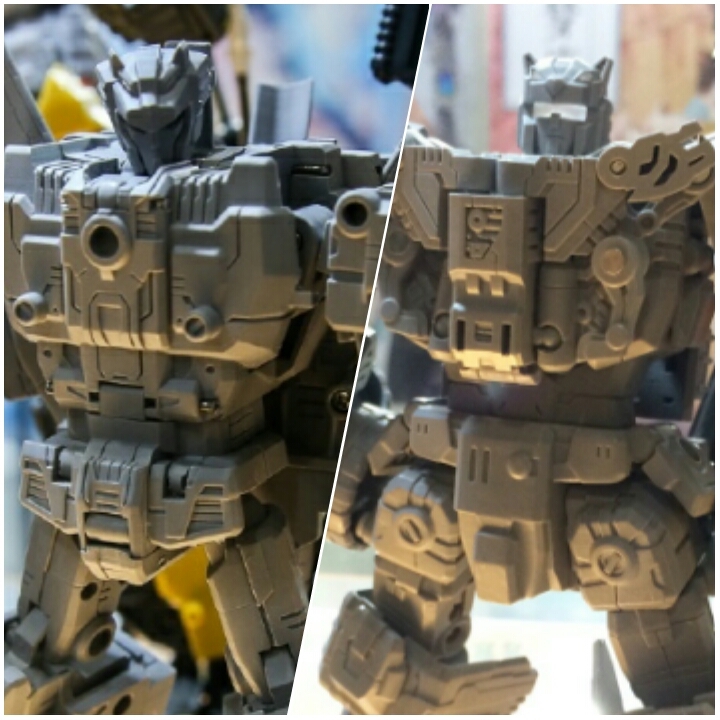 More reveals are heading our way as the China International Comics Festival continues in Guong Zhou, China, and this time we have higher resolution prototype robot mode images taken of Pandora and Rhadamanthus, G1 inspired of Jarugar and Leozack. After Hades‘ combiner mode was shown earlier at the convention, we have a look at these 2 team members’ detailed mold, their articulation points, along with their animal themed head sculpt thanks to images from TFC Toys and Weibo user psyuno. Their Breastforce partners were shown in all beast, weapon, and breast plate modes as well. Unfortunately, vehicle mode has » Continue Reading. 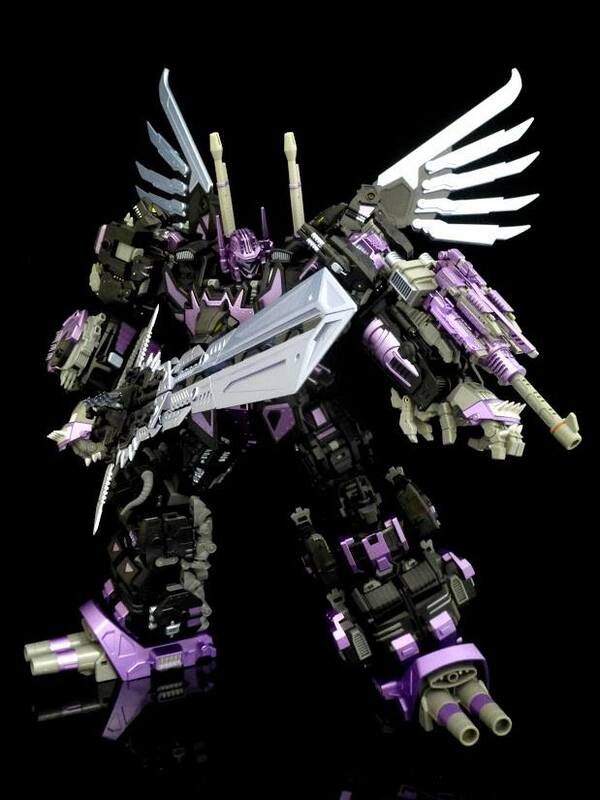 The post TFC Toys Hades – Pandora and Rhadamanthus Prototype Images appeared first on Transformer World 2005 - TFW2005.COM. For fans attending TFcon Charlotte on October 16-18, we have some great news to pass along regarding one of the available exclusive figures: Mastermind Creations Nero Rex! Nero Rex is a repaint of MMC’s Feral Rex featuring five figures in one box set. There will be two ways to obtain this massive combiner that many fans will agree is one of the best third party products: Planet Steel Express is currently offering the figure for a $460 prepay price (listing will be closed on October 8th), you can then pick it up at the MMC table during TFcon » Continue Reading. The post Mastermind Creations NERO REX Exclusive Available At TFcon Charlotte appeared first on Transformer World 2005 - TFW2005.COM. 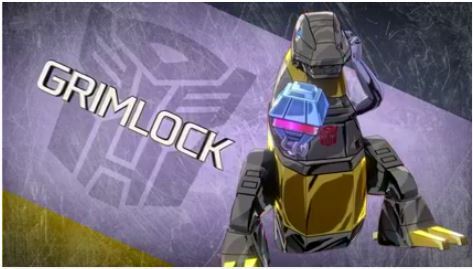 Right on schedule, the Transformers Game Facebook page have posted the video of Grimlock in action as a follow-up to the profile card they shared yesterday. Like any gameplay with Grimlock in it, the video showcases the Dinobot leader’s incredible strength and combat efficiency in both robot mode and dino mode. We also get to hear some more lines from his G1 voice actor Gregg Berger, as he roars battle cries and claims victory mid-battle over the puny Decepticons who stand in his way. Transformers: Devastation comes out next Tuesday so be sure to get your pre-orders in before it’s too late! » Continue Reading. The post Transformers: Devastation – Grimlock Profile Video appeared first on Transformer World 2005 - TFW2005.COM. Thanks again to 2005 Boards member Type-R for sharing a closer look at Masterpiece Hot Rod / Rodimus 2.0 from Takara-Tomy in full color. In the pics we see him in both modes and a display of his weapons / accessories which include a buzzsaw, matrix chamber, and fishing pole! Check out all the pics after the break and join the ongoing discussion for Hot Rod(imus) on the 2005 Boards! The post Masterpiece Hot Rod / Rodimus (2.0) Painted Prototype Full Look appeared first on Transformer World 2005 - TFW2005.COM. Thanks to 2005 Boards member Type-R we have a better look at last night’s quick tease of Masterpiece Shockwave in full color. Included are multiple angles of both robot and gun mode, height comparisons to Masterpiece Soundwave and Starscream, accessories, alt hands and even the light up feature! Check them out after the break and make sure to keep an eye on the ongoing discussion thread! The post Masterpiece Shockwave Painted Prototype Full Look appeared first on Transformer World 2005 - TFW2005.COM. More new goodies from Takara-Tomy for February 2016, this time from their Q-Transformers line! February sees Q-Transformers versions of Ironhide and Jetfire added to the mainline, and a new “awakened” version of the Q-Transformers Crossovers Evangelion Eva-01. 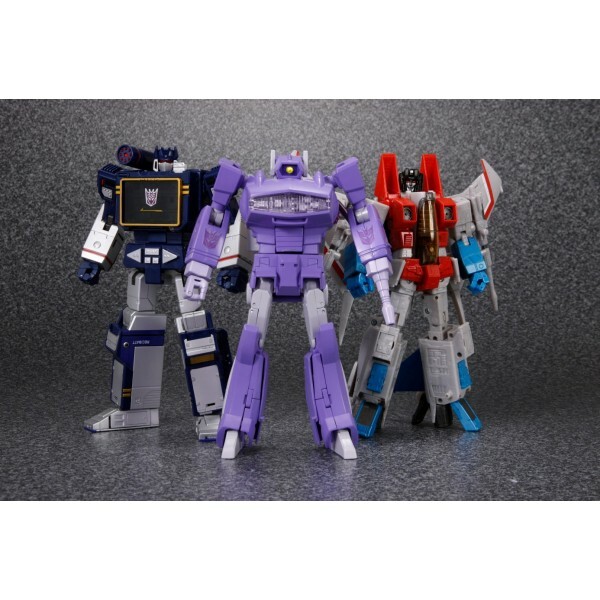 There’s also a second three figure set collecting Decepticons Megatron, Soundwave and Shockwave in their Q-Transformers incarnations on the cards, together with a set of plush toys of the main Q-Transformers cast of Lockdown, Bumlbebee, and Optimus Prime. Thanks to our sponsors TFSource for the heads up. The post Q Transformers Jetfire, Ironhide, Plushies and More appeared first on Transformer World 2005 - TFW2005.COM. Also via our sponsors TFSource, we have learned that Takara-Tomy will be issuing the Generations Springer toy once again in Japan! 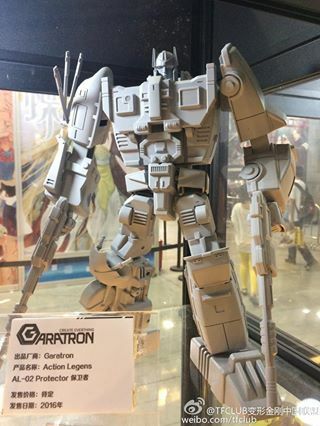 Springer’s mold has previously made it to Japan in 2013 as a part of the Japanese Generations line. 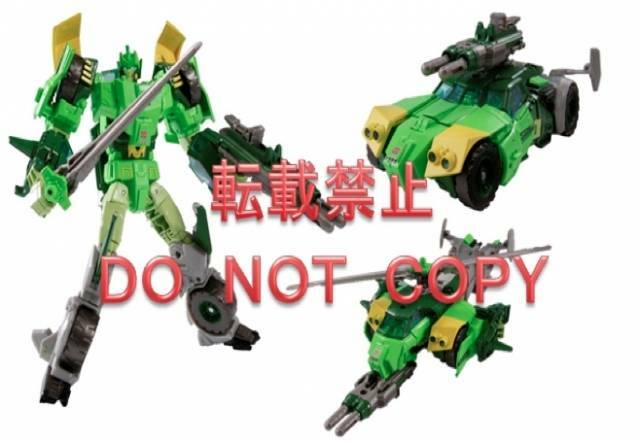 What this version is doing, though, is offering the mold with a color scheme that goes heavier on the green – it is a more screen accurate looking deco. 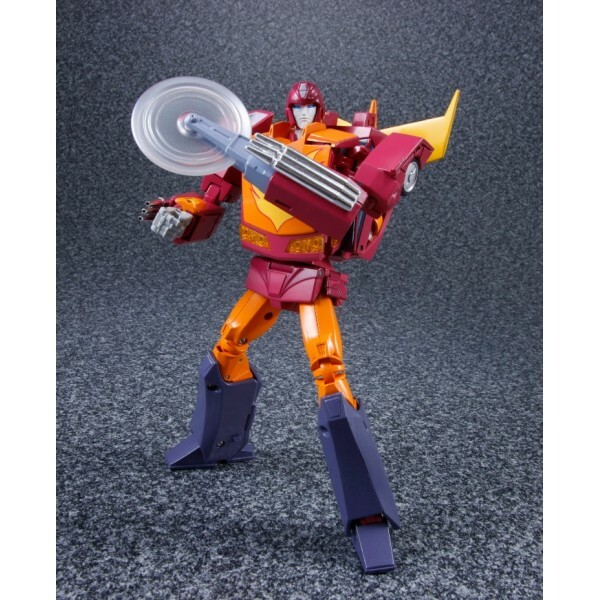 It’s hitting in February 2016, same time as the MP-22 Ultra Magnus reissue, and one month before MP-28 Hot Rodimus – looks like Takara-Tomy are starting as they mean to » Continue Reading. The post Transformers Legends LG-19 Springer appeared first on Transformer World 2005 - TFW2005.COM. 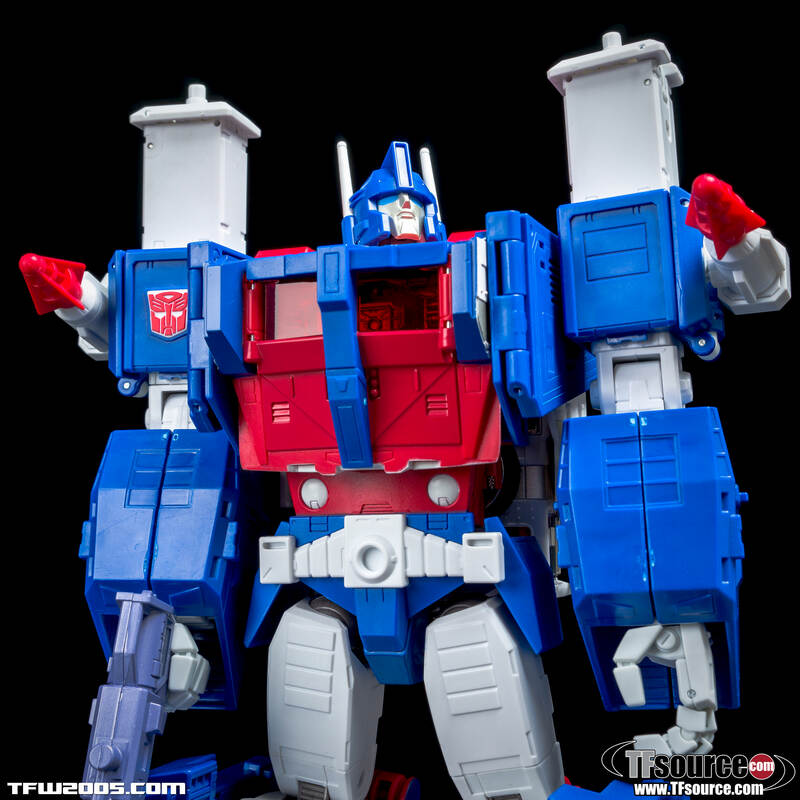 If you missed out on Masterpiece Ultra Magnus in all his die-cast eared glory, fear not! Via sponsors TFSource we understand that a reissue is coming next February! MP-22 Ultra Magnus is an amazing release that is truly worthy of the name Masterpiece, with some excellent engineering. If you missed him the first time, don’t miss him again – he can’t deal with that now! You are duly appointed to purchase the enforcer of the Tyrest Accord – check out our sponsors for some preorder links: MP-22 Ultra Magnus reissue at Big Bad Toy Store MP-22 Ultra Magnus <a href="http://news.tfw2005.com/2015/10/02/masterpiece-mp-22-ultra-magnus-reissue-302224">» Continue Reading. The post Masterpiece MP-22 Ultra Magnus Reissue appeared first on Transformer World 2005 - TFW2005.COM. Not long after their surprise unveiling a few days ago, site sponsor TFSource has tweeted pics of painted prototypes of Masterpiece Hot Rod and Shockwave! That’s not all, along with being in color, we also get a look at each of their alt modes! Hot Rod is shown in a third image in alt mode riding in Ultra Magnus’s trailer, fitting just right, while in Shockwave’s respective third image, the ever-logical guardian of Cybertron is standing alongside his fellow Decepticons, Soundwave and Starscream! Shockwave is also shown with a stand for his gun mode which will be a huge help » Continue Reading. The post Masterpiece Hot Rod and Shockwave – Colored Prototype and Alt Mode Images appeared first on Transformer World 2005 - TFW2005.COM. Transformers Figure Collection Capsule Toys – Decoys Return! 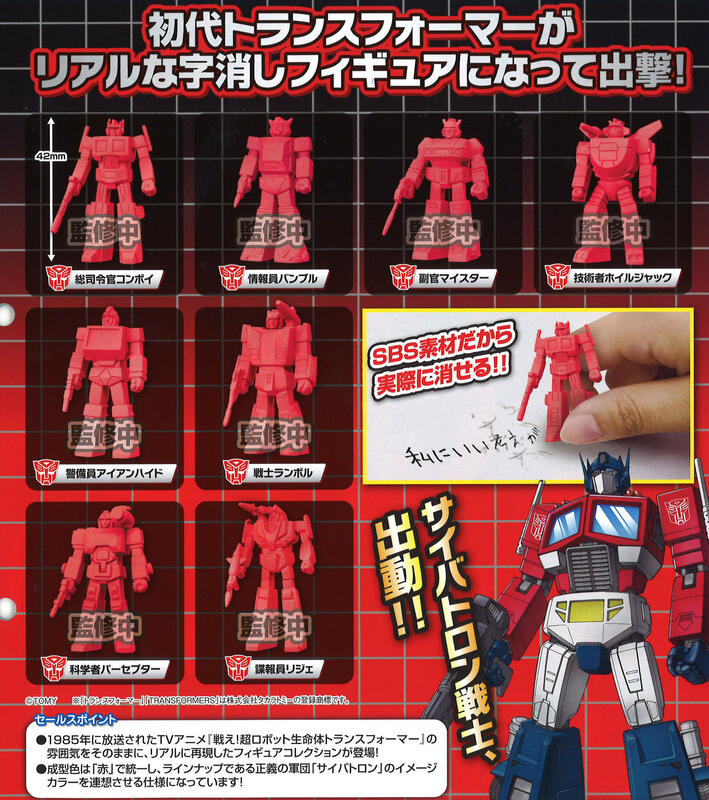 Takara-Tomy have announced a new series of Transformers Capsule Toys. Retailing at 93 yen, these capsule toys are little rubber versions of classic Generation 1 characters like Optimus Prime, Mirage, and Jazz. They can even be used as erasers! These guys reference the original Transformers Decoy figures from the 1980s, who were pack-ins with some of the 1987 toys such as the Throttlebots. They seem to be a little taller at 42mm, though, and they have updated sculpts compared to the original Decoys. There’s eight of them in total in this series: Optimus Prime, Bumblebee, Jazz, Wheeljack, Ironhide, Sideswipe, Perceptor, » Continue Reading. The post Transformers Figure Collection Capsule Toys – Decoys Return! appeared first on Transformer World 2005 - TFW2005.COM. It’s one week to go until the official release of Transformers Devastation! As the time draws near, the Transformers Game Facebook page has put up a profile of the big guy himself, Dinobot commander Grimlock! True to his classic incarnation, Grimlock is all about strength and power in both modes – and when that does not work, he uses his powerful fiery breath! 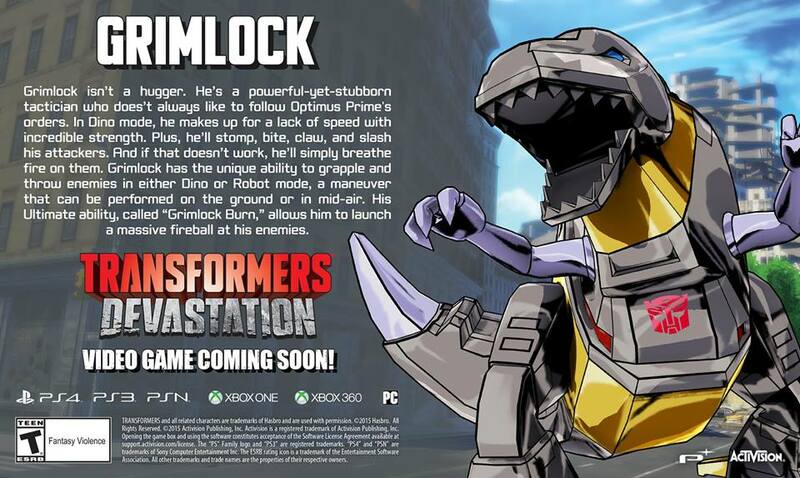 That’s not all though, as via Gamestop there are a couple of video clips showing Grimlock in action, with Gregg Berger reprising his role as the voice of Grimlock. Check it out to see Grimlock in » Continue Reading. The post Transformers Devastation Grimlock Profile and Video Clips appeared first on Transformer World 2005 - TFW2005.COM. Third party group Toyworld has been all the talk the past 24 hours after revealing their fully combined prototype of their homage to Devastator. Thanks to site sponsor TFsource, we’ve now received our first prototype images of one of their limbs that pays homage to Bonecrusher. This prototype was the figure we saw yesterday with fully moveable treads. 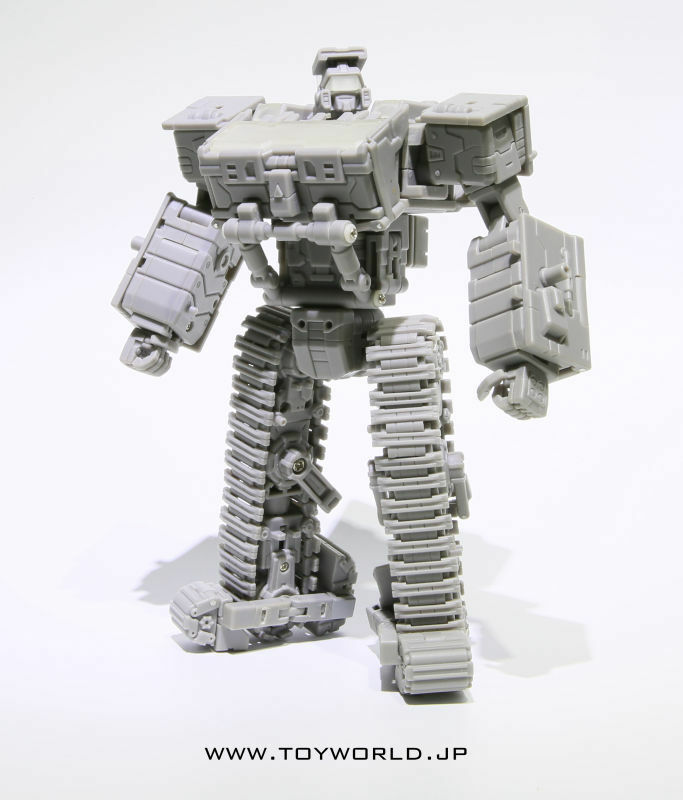 Toyworld passed along some more information to TFsource: the total height of “Devastator” is in the 50-55 CM range/ 20-22”, just shy of 2 feet which sets him just below the height of Generation 1 Fortress Maximus when combined. More » Continue Reading. The post Toyworld Reveals First Prototype Limb For Devastator Combiner appeared first on Transformer World 2005 - TFW2005.COM. 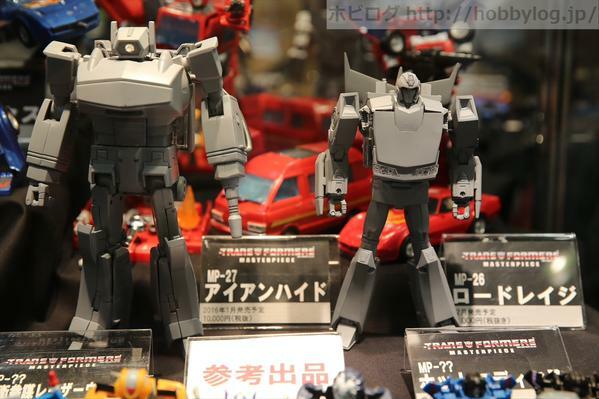 Third party newcomers Garatron have shown off a couple of new prototypes via Weibo. They’re joining the Third Party Combiner race with their own versions of Defensor and Predaking, except these ones do not combine, or even transform. They’re nice, bulky action figures with a slick look that is reminiscent of the animation models of the characters. Predaking in particular looks very Call of the Primitives. Check out the images attached to this post. The post Garatron Defensor and Predaking Action Figures appeared first on Transformer World 2005 - TFW2005.COM. 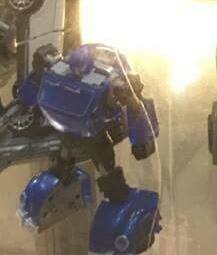 Third party group Toyworld are showing off a recolor that indicates that they are not done with their Bii mold. Originally released prior to Masterpiece Bumblebee, Bii is getting a new release as one of the Generation 1 Bumblebee toy’s recolors, Glyph. There’s a possibility this unofficial Glyph will sport a new head, though this initial image is not clear enough for a good look to know for certain. The post Toyworld Glyph (Bii Recolor) appeared first on Transformer World 2005 - TFW2005.COM. 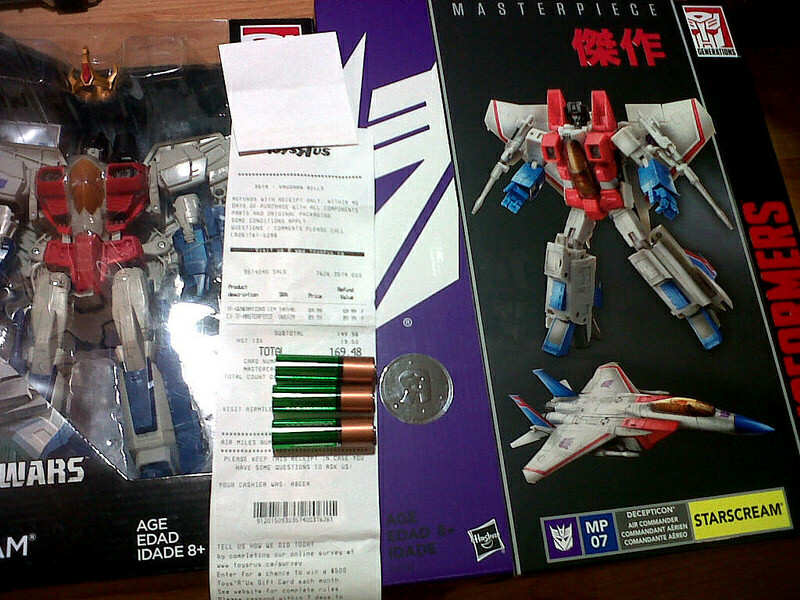 Good news for those residing in Canada, TFW2005 member Crobot91 has reported to us that the Toys ‘R Us exclusive Masterpiece Starscream has been purchased at retail! Purchased near Toronto for $89.99 CAD, this is our first reported retail sighting in Canada of the most famous Seeker. Be sure to use our sightings forum to help each other out, and to also check out our most recent gallery of Masterpiece Starscream! Happy hunting Canada! The post Hasbro Masterpiece Starscream Purchased At Canada Retail appeared first on Transformer World 2005 - TFW2005.COM. Q-Transformers season 2 continues as episode 13 as just been uploaded to YouTube. As always, keep a lookout for a translation / summary of the video to help us follow along! Enjoy the new episode! The post Q-Transformers Season 2 Episode 13 on Youtube appeared first on Transformer World 2005 - TFW2005.COM. 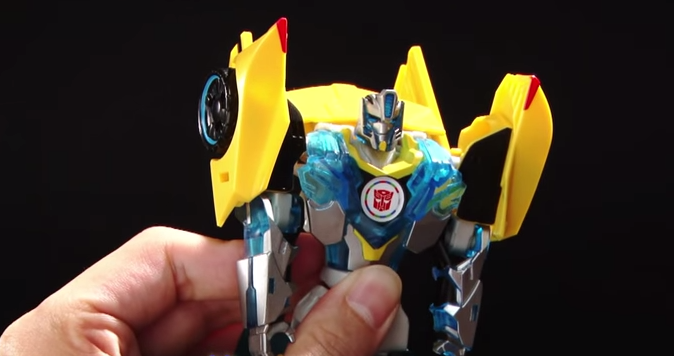 Thanks to the official YouTube channel of TakaraTomy, we’ve received a handful of new transformation videos for Transformers Adventure figures releasing in October. The videos are purely transformation shorts, about a minute long, but give us a great look at these figures. 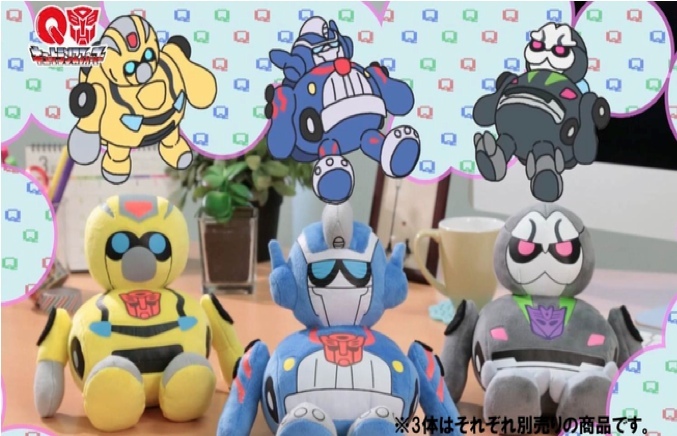 Included in the videos are the following figures: TAV29 Bumble Bee Supreme TAV30 Battle Grimlock TAV31 Black Shadow TAV32 Rumble & Frenzy TAVVS04 Stepper TED-13 Drift TED-14 Fracture Click on the above hyperlinks to be taken to the videos. Enjoy! The post TakaraTomy Official Transformation Videos For October TAV Releases appeared first on Transformer World 2005 - TFW2005.COM.